Unleash the superheroes within you, your friends and family using this all-inclusive PJ Masks Themed Party Pack for 16 guests. 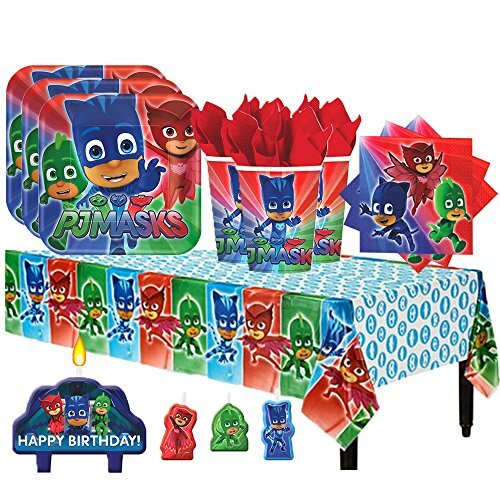 Inspired by PJ Masks heroes Connor, Amaya, Greg, and their alter egos Catboy, Owlette, and Gekko, our party pack is designed with your child in mind and contains 16 emblematic PJ Masks themed plates, 16 PJ Masks cups, 16 PJ Masks napkins, 4 PJ Masks Themed Birthday candles, and a PJ Masks table cover. All the essential components of a PJ Masks themed get together are in this pack! Another Dream is also pleased to add an EXCLUSIVE bonus Thank You Card with this essential party pack! Cup Specifics: 9 oz Plate Specifics: 9" Square Plate Table Cover Specifics: 54" x 96"
If you have any questions about this product by Another Dream, contact us by completing and submitting the form below. If you are looking for a specif part number, please include it with your message.